Oak trees have been on flags, stamps, documents, seals, and other symbolic objects. The wise oak tree has been a symbol of wisdom and knowledge inherent in its unshakeable strong trunk. The power to attract lightening has rendered it to be celebrated as a sign of power and strength. Oak trees have held a lot of significance in many cultures and societies for thousands of years, and they still continue to do so. It’s ability to stand strong against nature’s storms has earned it many titles: King of the Forest, King of the Greenwood, and more famously the Mighty Oak. Perhaps for this reason, oak trees are the national tree for a large number of countries including Serbia, Cyprus (Golden Oak), England, Estonia, France, Germany, Moldova, Romania, Jordan, Latvia, Lithuania, Poland, Wales, Galicia, Bulgaria, and even the United States! 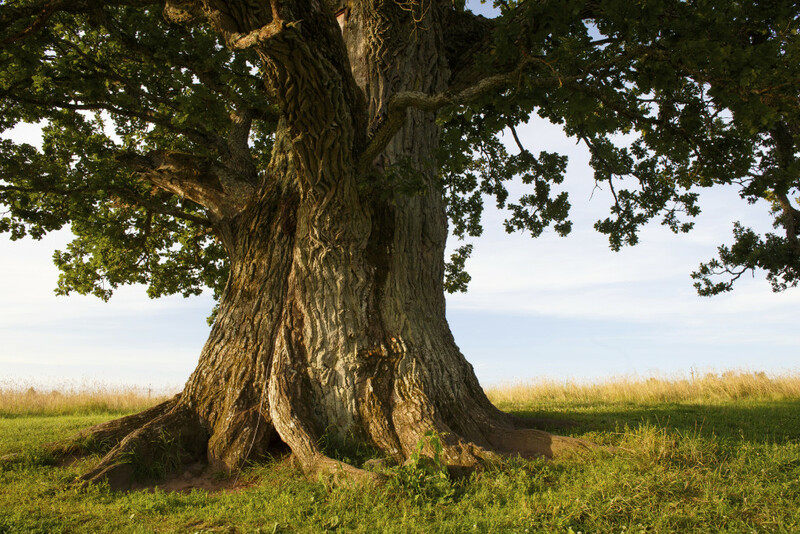 In Celtic lore, ancient celts believed the impressive expanse and growth of the oak tree was a clear sign that it was honored for its endurance and “noble presence”. They actually used oak trees to denote a special status among the community – the Greeks and Romans also did this. The oak tree makes repeated appearances in Celtic cultures and folklore. Anybody who’s watched Disney’s Hercules or Clash of the Titans knows that Zeus was considered the King of Gods. In his oracle at Dodona, Zeus was revered in the oracular oak, and his voice would be heard in the rustling of oak leaves (usually interpreted by priests), the same way it was heard in thunder. The Bowthorpe Oak over a 1000 years old from Bourne, Lincolnshire was featured in the Guinness World Records. The Crouch Oak located in Addlestone, Surrey believed to have originated in the 11th Century, is an important symbol of its town. Legend says that Queen Elizabeth I had a picnic underneath it. The Seven Sisters Oak is the largest certified southern live oak tree. It has a trunk with a diameter of 38 feet. It’s age? Just about 150o years old! The Major Oak is located in Sherwood Forest, England. The same forest where legendary Robin Hood and his merry men lived.